The enormous volume of chemistry data available in peer-reviewed literature, patents and substance databases would not be navigable without an intelligent approach to indexing. Reaxys indexing ensures that every researcher can find the answers they need quickly. Indexing means adding terms to define the content in peer-reviewed literature and patents so that the search algorithms can match the right answers with a search query. In Reaxys, to enable maximum discovery of chemistry data, two indexing processes are used: manual indexing and data excerption for the core chemistry journals, patents and textbook; and a novel, human-like automated indexing process for the broader range of chemistry-related periodicals and patents. In the competitive world of modern R&D, research chemists have to gather relevant information and make informed decisions quickly. 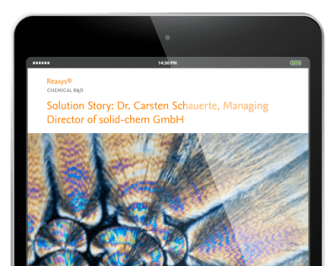 In this exclusive interview, Dr. Peter Witte of BASF reveals how Reaxys helps in the discovery and development of his team's work on catalysts. He also talks about how looking at reaction conditions can help in the important drive toward sustainability. Time is a precious commodity for Dr. Carsten Schauerte, managing director of the chemicals company solid-chem GmbH. Searching for high-quality answers was one of the most timeconsuming tasks for him and his team until he started using Reaxys. Thanks to its smarter chemistry search capabilities, he can accomplish more in less time.